When we came to the area where the buses depart to Bolivia, we realized that this area is actually a little Bolivia. There were some local Bolivian restaurants next to the bus companies and it was possible to see some women rushing around in local dresses and with knitted hair. In fact, the bus which we got on after eating something weird in one of these restaurants was a sign about what awaits us in Bolivia. The bus was old and rugged unlike the nice and comfortable buses in Argentina and Chile. There were no other tourists on the bus and more important fact was that everyone except us had some blankets with them. It was cold and windy when we got off the bus when we arrived to the border. The loud noise of the trucks were joining the voices of rushing people in the only open border between Chile and Bolivia. We got back on the road after completing the border processes and spending some time to find our busses. Of course we didn't forget to eat buy some snacks, we were really hungry. It was nearly midnight when we arrived to the city of Oruro. We wanted to find a bus to Uyuni quickly but the doors of the bus terminal were already locked. We found a place to sleep and went to bed quickly. Next morning we bought a ticket to Uyuni after selecting one of the companies, there were old ladies shouting "Uyuni, Uyuniiiii" in front of all of them. We spent the rest of the day walking around the city. With Paraguay, Bolivia is one of the 2 countries who doesn't have access to sea in South America. It has been a colony of Spain for a long time but it has been liberated in the first half of 1800's. It is difficult to say there is a stable political situation since then, as a matter of fact there have been more than 180 different governments in duty in 150 years. This may be a reason why Bolivia is the poorest country in South America. On the other side, the country is really famous with its natural beauties. That's actually why we came here. We knew that it would be difficult to breath since the country is mountainous and the altitudes are very high. Oruro has an altitude of 3700 metres. I thought that my body is already prepared to altitude since we had similar situation in Tibet but I was wrong. I had to walk the city with slow steps. Nearly all local woman we saw around had round hats. Besides there were many women carrying their little babies in colorful sheets tied to their backs. It was obivous that the people in here do not know much about birth control. There were colorful markets in the streets of the city. People were busy with shopping while we were busy with taking photos. But we were rejecte4d frequently. After eating something in Mercade Fermin Lopez, we spent some time roaming around and got on our bus to Uyuni at night. Everyone had blankets again but this time we were prepared as well. After the paved road in the first part of our Uyuni trip was switched to earth road, the second part of the trip was uncomfortable and sleepless. As a matter of fact, we went to sleep right after finding a hostel. We roamed around the city in the afternoon. Tourists which we didn't meet in Bolivia were around. Actually Uyuni is a little town but thanks to Salar de Uyuni which is next to it, it is full of travel agencies and hotels. But we saw the actual face of the city when we got out of the city center. The streets were full of people because of the fair which is set up every Sunday and kids were the happiest ones. Some of them were in the line to get on the ferris wheel while some were shooting against a little goal. Adults were busy with eating or participating a game similar to bingo. And of course there were some listening to the fortunetellers carefully. We joined the crowd, ate something local with them. The hot drink called api was really special. After registering to a 2 days tour in Salar de Uyuni, we watched the concerts in the city. We were lucky, it was the national fest time in Bolivia. We would be meeting some more activities in different cities during following days. The winter was still effective in South America. The snow which didn't let us cross the border in south also effected our Salar de Uyuni tour. We couldn't go the high southern lagoons because of the snow thus we decided to go to the train cemetery and another lagoon known as Black Lagoon. The lake was covered in ice but the birds walking on the ice weren't really unhappy about this. We watched the rural Bolivian life known as altiplano all the way. The lamas feeding around seemed to be happy. We also visited a valley full of volcanic rocks. We spent the night in Villa Alota where we didn't see many people. There was lama meat in the dinner as we thought so. They weren't very happy on the table. Early next morning we headed to Salar de Uyuni despite the cold weather. Salar de Uyuni was one of the must-see list before starting the round the world trip and we realized that we were right after we first saw it. The kilometres length of white ground was formed of salt cristals and there was a few centimeters of water on top. The salt flat felt like it is something out of this world. I was feeling like flying as our jeep kept on going on the salt flat, the ground full of water was also blue like the sky because of the reflection. I was staring around in a dazzled way when I got off the car and step on the ground. Salar de Uyuni is known to be one of the biggest salt flats in the world, it is 7 times bigger than the salt lake in Turkey which is also the second biggest lake in Turkey. It has a total of 10 million tons of salt capacity but 25.000 tons of it is extracted each year. A little kid working in one of the salt factories out of the lake gave many information similar to these ones but our knowledge is limited to these since we couldn't understand him. After taking many photographs in and around lake, we arrived to the Cactus Island (Isla Del Incahuasi) which is 80 kilometres in. It is possible to define this island as a weird island in a lake out of this world. The island is in the middle of the lake and full of large cactuses, that's why it is known as the cactus island. The view on the top of the island was really awesome. It was possible to see the Ollagüe volcano which didn't let us pass the border, the reflection of the volcano on the water, an island full of cactuses which we also were on and cars cruising on the salt flat. In order to come to Salar de Uyuni, we spent many extra hours which of them were mostly sleepless on tough roads but this view was worthed all of them. We returned to Uyuni town and changed our clothes which were full of salt and got on the bus to La Paz. The fat lady checked our tickets and then gave blankets to everyone. After we had more passengers and they are seated on the ground in the corridor, we hit back on our road to La Paz. We arrived to La Paz in the morning. What we saw through the window were the first impressions about the highest capital of the world. We were in a capital which was established in a high valley surrounded by high mountains and the slopes of these mountains were also full of paintless houses. Our hostel in La Paz was quite nice, actually that was what we thought in the beginning. But then we realized that it was actually a party hostel which meant sleepless and loud nights. Thus we spent most of our time outside.All the roads were ending through a hill in La Paz. I was already having difficulty about breathing and climbing to these hills were really tough for me. It may also be because of I am getting old, I don't know. We wandered around the famous Witches Market and the Coca Museum. Coca is the base material for Cocaine and Bolivians really like it. The witches market seemed a little bit touristic but it was weird to see lama fetuses hanging on the walls, they were used for some magic. Next day, it was time for an important experience. 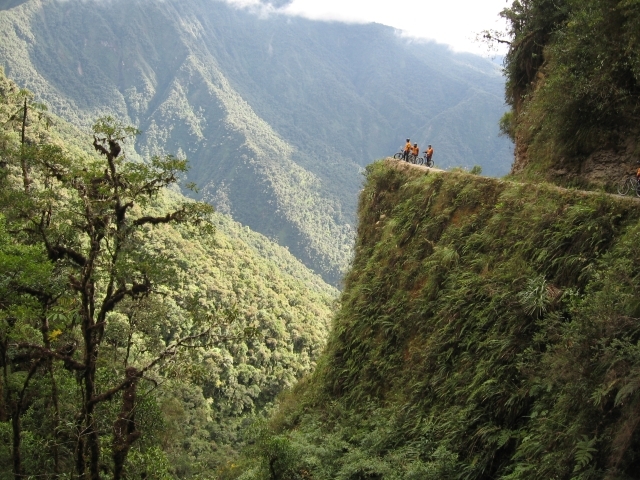 We would pass the 68 kilometre road which is known as the most dangerous road in the world by bike. I remember that I saw some news about this road in the internet newspapers. A new road has been opened recenty and this road is being used by adventurers mostly. It is still possible to see some cars on the road but there are more bicycles. Many travel agency in La Paz organizes some tours regarding here. We also registered one of them thinking how dangerous it would be. But after seeing the deep cliffs and narrow road, we also agreed that the road deserves its fame. We also noticed many crosses and some monuments for the people died here, that confirmed our idea. After the 4 hours that we nearly never pedalled, we arrived to Coroico. We descended from 4700 metres to 1300 metres in 4 hours. At the end of the trip it was time for warm weather, a nice lunch and crystal clear pool. We arrived to Copacabana which is our last stop in Bolivia after a few hours of trip. Copacabana is just next to the Titicaca lake which is known as the highest navigable lake in the world. Thousands of tourists come to this little town each year in order to visit Isla del Sol in Titicaca lake which is the birth place of Inka culture. Our own main aim was to watch the special ceremony held on sunday mornings and see Lake Titicaca. After seeing the cars lined up in front of the big catedral in the center of the town, we realized how important this ceremony is. We watched the blessing of the cars and trucks adorned by flowers and miniatur cars by the priests after the sunday mass. It was possible to see how happy the owners were. The photographs shot consecutively and the champagne bottles were also signs for these. We headed to Isla del Sol during our last hours in Bolivia before crossing the border to Peru. We spent some time in the island which has some archeological ruins, returned to Copacabana and got on our bus to Cuzco.